Congratulations to Kosovo! now the youngest nation on earth. 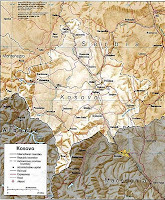 Last 17th February 2008 Kosovo declared its Independence from Serbia. Following the declaration by the Kosovar Assembly several countries such as United States, Turkey, Albania, Austria, Germany, Italy, France, United Kingdom, Australia, etc. announced their recognition. With more than 90% population are ethnic Albanian Kosovo is going to be a 4th Muslim majority European nation after Turkey, Albania and Bosnia-Herzegovina. Interestingly the history of Sufism in Balkan region, including that of Kosovo is very rich. The southeastern Europe under nearly six centuries of Ottoman rule brought sufi orders at the heart of Europe with the religion of islam. / Quoted from the article by Huseyin Abiva, A Glimpse at Sufism in the Balkans: Indeed, among the nations that now comprise the Balkans Peninsula (Albania, Bosnia-Hercegovina, Bulgaria, Croatia, Greece, Macedonia, Montenegro and Serbia) the visible Muslim component to their populations are readily evident. As with other Muslim lands, the historical role that the Sufi tariqats played in the preservation and propagation of Islam in the Balkans cannot go without notice. It can be said with all fairness that the implantation of Islamic Civilization here could not have been possible without the efforts of these Sufi shaykhs and their orders. The Sufis of the Ottoman Balkans added enormously both to the development of an Islam of the intellectual arena as well as a ‘folk’ Islam of the masses. Though now a mere shadow of a once vast manifestation, the influence of Sufism can still be felt at both the popular and academic level among the Balkan Muslim population. The extent of the impact of Sufism and its role in Balkan Islam can be seen through the number of tariqats (mystical brotherhoods) that functioned in the region over the centuries. The largest and most wide-spread of these tariqats were the Halveti (Khalwatiyyah) and the Bektashi. Though minimally represented at present, these two orders dominated all others during the Ottoman Era. They were followed by the Naqshibandi, Qadiri and Rifa`i in size and distribution. All three of these tariqats have managed to survive to this day. Though the overwhelming majority of Sufis in the Balkans are associated with the Ottomans, the one of the first Sufis to have come into the area was the Bektashi saint Sari Saltik (Mehmed Buhari). Though most of the exact details of his life are clouded by legend, this fourteenth century Sufi traveled throughout the region decades well in advance of the Ottoman armies. His maqams (shrines) can be today found in any number of places including Bosnia (Blagaj), Romania (Babadağ), Macedonia (near Ohrid) and the most famous in Albania (Kruja). Balkan Sufism beyond : It is important to note that the first Sufi lodge to be established in North America was the First American Albanian Bektashi Monastery. This center was founded in the early 1950's by Baba Rexhep (d.1995), native of the southern Albanian town of Gjrokaster. This remarkable figure managed to preserve the Bektashi identity of many Albanian Muslims despite the pressures from the anti-religious programs of his native land and the pull of assimilation in the United States. Over the decades the tekke (which is located outside of Detroit) expanded in size and membership. Following the death of Baba Rexhep, the tekke is now under the directorship of Baba Flamur Shkala, a very energetic and young shaykh who will hopefully serve his community well. From the book, Religion and Politics of Identity in Kosovo, Gerlachus Duijzings writes: 'The Muslim mystic orders of this country (former Yogoslavia) have not only continued to exist, but moreover seem to be characterized by a renewal that is very curious and at the very least unexpected. This is all the more so as these orders, after a difficult survival at the end of 19th century and the first half of the present century, tend to dissappear from 1945 onwards. ... The dervish orders in Kosovo mainly has members from Albanian rural masses and the Bosnian community. ... The revival of popular sufism was largely confined particularly in Kosovo. Interestingly the Kosovan dervishes had difficult relationship with teh Bosnian orthodox muslim establishment. Dervish orders in Kosovo: a survey (from Religion and the Politics of Identity in Kosovo) Due to the negative effect of communist power in Yogoslavia, most of the dervish orders were pushed underground. The dervish orders were labeled as reactionary and an obstalce to teh development of a proper religious life ... even later after 1950s, and 1960s. Many observers expected that dervish orders would cease to exist, as happened in mnay other Balkan states. However this was contradicted by an unexpected revival of the phenomenon in 1970s. In 1974 the Albanian sheikhs from Kosovo founded an association of dervish orders which has been headed since then by a Rufai Seikha from Prizren (Sheikh Xhemali Shehu). In late 70s, the Community of Dervish Orders was founded which now enjoys more than 100,000 followeres in Kosovo alone. The Community recognizes 12 'authentic' orders of whcih nine were active before the start of the war in former Yugoslavia: The Rufai, Kaderi, Halveti, Sadi, Bektashi, Nakshibendi, Sinani, Mevlevi and Shazili. Among them Halveti, Sadi, Kaderi and Rufai have large membership and thousand of followers with wide network of sufi lodges. In some areas dervish orders flourished among the Gypsies. When Compared with Bosnian Sufism, that of Kosovo and Macedonia is considered more ecstatic popular form of Sufism. Bosnian sufism is more elitist, somewhat quetist, sober and subdued. / In the article published in Front Page Magazine, Getting to Know the Sufis, Stephen Schwartz wrote: "(...) in Kosovo, Sufis played a major role, over decades, in resisting, sometimes by means of guerrilla war, the abuses inflicted on Albanians by the Turkish authorities, and later by Slavic imperialists. ... In places where Sufism is dominant, spiritual traditions may play a positive role in fostering civic values conducive to democracy. 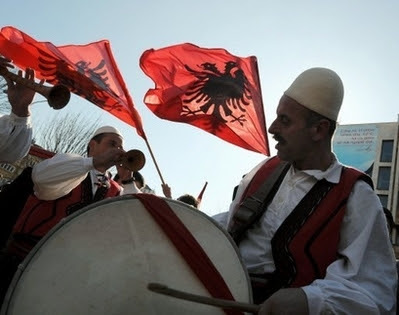 The Bektashi Sufis of the Albanian lands, counting 3 million members from Kosovo to northern Greece, for example, declare boldly that they are "the most progressive Muslims in the world!" --as I was vociferously reminded in 2003 by Baba Tahir Emini, their leader in Western Macedonia. They are especially known for their dedication to women's rights and popular education ..."
/ Serbia have been protesting the independence of Kosovo, so is their ally Russia. Green Sufi writes: Although it is a 90% Muslim land, of ethnic Albanians, some Orthodox Serbs wish to deny it's freedom and have launched a vicious campaign against it with the help of [anti-Muslim] sympathizers. It is nonsense to assert that Kosovars should remain under tyranny simply because they were "part of Serbia." Well for centuries before that they were all part of the Ottoman Muslim Caliphate. Stephen Schwartz writes, why Kosovo recognition is the right decision.